Limestone County Bill of Sale of Motor Vehicle Form is a legal document intended to facilitate a sale/transfer transaction of a motor vehicle in the jurisdiction of the Limestone County of Alabama State. This bill of sale form of Limestone County requires notarization of signatures of the Seller and the Buyer for its legal standing. This form further implies that the seller does not undertake any warranty of the motor vehicle upon the completion of the transaction. The form consists of four sections. You as a seller may want to appoint an authorized agent/dealer to sign this form on your behalf upon enclosing a power of attorney to grant the powers to transact. The buyer must apply for registration of the title and tag within 20 calendar days to avoid penalties due to delay. Enclosing this Motor Vehicle Bill of Sale form during the title and tag registration is necessary as the value of sale mentioned in it is considered for computation of taxes for the buyer. This Limestone County Bill of Sale of Motor Vehicle form has four prominent sections requiring inputs by the seller, buyer, and notary public of Alabama State. This part of Limestone County Bill of Sale of Motor Vehicle requires input of various details about the transactions and the Buyer of the motor vehicle. 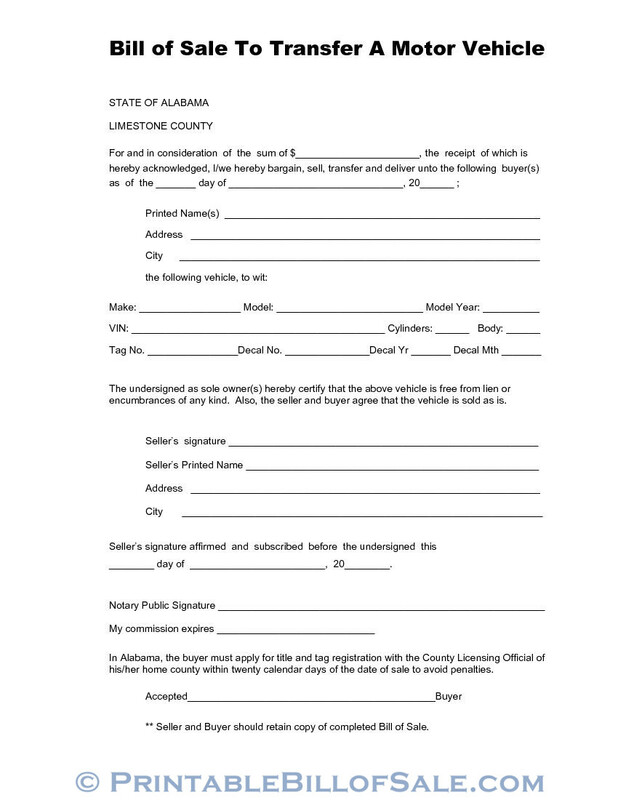 Limestone County Bill of Sale of Motor Vehicle form requires Seller’s printed name, signature, address of the seller, and city name in this section. Please sign before the notary public of Alabama State for the execution and legal standing of this document. The last portion of Limestone County Bill of Sale of Motor Vehicle has space reserved for notarization. 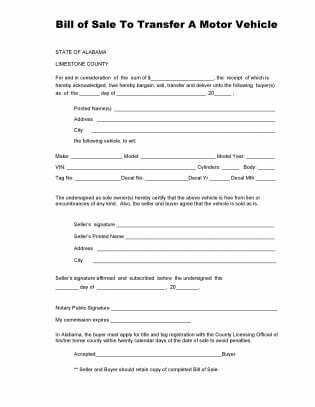 Inputs by the notary public of Alabama State are required in this section. The Buyer must sign this form before the notary public in acceptance to the execution of this Limestone County Bill of Sale form.